The study of the use, influence and impact of the Bible is called reception history. It is a great way of relating the Bible to politics, art, culture, society and many other areas. The book of Exodus has been extremely influential in American history and culture. The book tells the story of the Israelites and their suffering as Egyptian slaves, Moses, gaining their freedom and their journey to the Promised Land of Canaan. Exodus has produced many phrases that have found their way into American speech, for example, “Let my people go,” and “Thou shalt not . . .” American politicians, visual artists, writers, and filmmakers have found the book of Exodus to be a gold mine. Americans have used the Exodus story for a variety of causes but three important historical events relate parallel to the journey of the Israelites. The American Revolution, the Civil War and the Civil Rights Movement, illustrate similarities to the book. Shortly after the declaration of independence for Great Britain, Benjamin Franklin, Thomas Jefferson and John Adams proposed a design for a national seal. It portrayed the Egyptian Pharaoh leading his troops through a divided Red Sea in pursuit of the fleeing Israelites. Although Congress didn’t approve their suggestion, it shows a common use of Exodus: “to validate and rally groups that are confronting a stronger foe.”(Scott M. Langston 1) Rebelling against the, much stronger, British Empire would have been impossible if it were not for the support of the American people. Franklin, Jefferson and Adams used Exodus to justify the rebellion as an act of obedience to God. This is just one example of the many uses of the journey to the Promised Land in our history. In my essay, I plan on discussing many more parallel events and comparing/contrasting them. I will discuss depictions of Exodus in ancient and modern American art. I would also like to compare the plots of a number of movies and books to the infamous book. This entry was posted in Research Essay Prospectus and tagged American history, Israelites, Modern day Exodus, The book of Exodus. Bookmark the permalink. I like this topic a lot. Until we really looked at the book at Exodus, I didn’t know that so many historical figures used the book of Exodus. But after learning that, it makes a lot of sense. I think it will be quite interesting to see how many times and events where people have been stuck in a place and used the book of Exodus as a sort of outline or inspiration. I think that paralleling the stories in the book of Exodus to other groups who have been searching to be freed would be a good idea as well. The movie idea comparison is another part that I think will be very interesting to see. We knew the Bible played a role in everyday life, but to see it portrayed in movies is a great way to show how we use the histories in the Bible in today’s society. I like where you’re taking this topic. I would have never thought to analyze movies for Exodus references. This should be a very interesting paper to read when it’s finished. 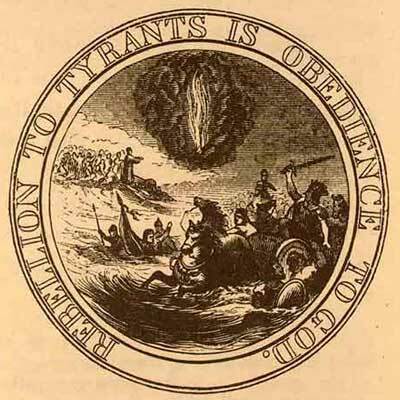 It’s also interesting how you mentioned that some of the Founding Fathers viewed the Revolution “…as an act of obedience to God.” Having never looked at the American Revolution in such a light, I think this will provide a very educational line of thought for others (like me) who didn’t know this before. Can’t wait to see where you go with this! I really enjoyed reading this prospectus. This sounds like a very interesting topic that every citizen can relate to, so there is a general audience that can be targeted. Obviously there are multiple parts of Exodus that can be cited, as well as scholarly studies, so sources should not be a huge problem for you. I would suggest trying to narrow down your topic/ideas and focus on two or three key passages and parallels that you would want to use; that would make a better research paper. Overall I would say you have a good foundation to build off of and I look forward to seeing how you progress with your paper this semester. I find it completely believable that figures like Ben Franklin and George Washington would invoke the religious roots of many of the then Americans in order to support a rebellion. The idea of always pushing forward and seeking greater things did not originate in America, but its more of a universal theme that I think a lot of people can relate to. The major opponent of such a large change is often the fear of change itself. I think we can relate to Exodus by considering what we would do if we were suddenly forced into a way of thinking or living, like the colonists were before the American Revolution. I’d also like to add that freedom is something most people think is worth fighting for, and in some cases, Exodus supports that argument pretty well. I think this is a fascinating topic, and I like the direction you seem to be going with it. The events and artifacts of American history and popular culture are replete with biblical and classical allusion; as you pointed out, the Patriots were quick to adopt the character of Exodus in their revolutionary rhetoric. It’s also interesting how the narrative of Exodus could be (and was) applied to the cultural narratives of many immigrant populations in the US who had fled political and social repression in their homelands in the 19th and 20th Centuries. From immigrant communities to the Civil Rights Movement, American history really shows how disparate elements of a culture, which might seem to be in conflict, can adapt the same literary text for almost any purpose. It really speaks to the influence of Exodus and the OT in Western culture, and their versatility as works of literature.